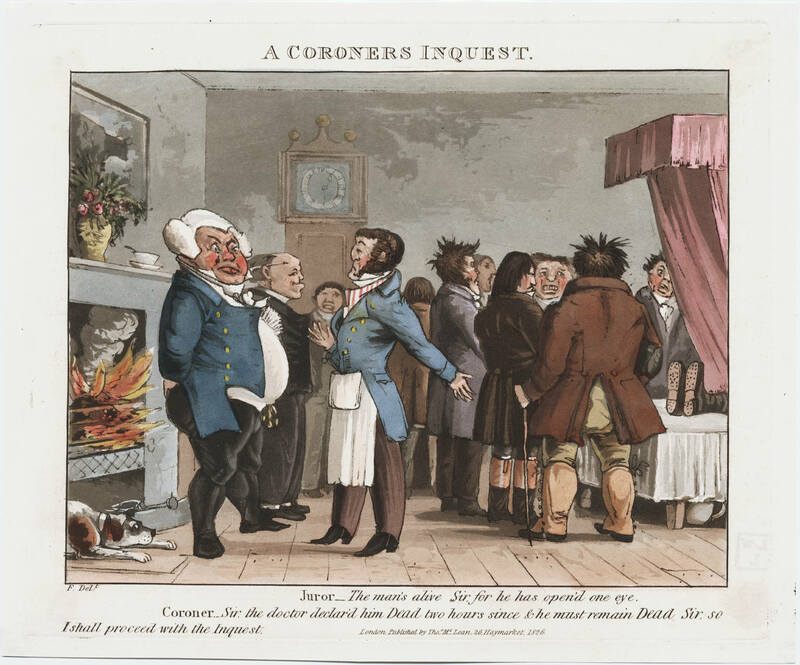 A Coroner's Inquest, 1826. ©Lewis Walpole Library. Coroners’ Inquests were held within forty-eight hours of a suspicious death, and were normally conducted at a local alehouse, parish workhouse or in the building in which the death occurred. Deaths among prisoners in custody were also subject to an automatic inquest. Westminster Abbey Muniment Room, Westminster Coroners' Inquests, 1760-99, LL ref: WACWIC652020368. Westminster Abbey Muniment Room, Westminster Coroners' Inquests, 1760-99, LL ref: WACWIC652020369. Inquests produced a range of documents, which are usually bundled into a single set. The series of inquests for Westminster, the City of London and Southwark are unusual in that they almost invariably include a full set of depositions as well as the more formal documents common in other series. The most formal document produced by a coroner following the legal examination of the cause of death was the inquest itself. This was a parchment document with a brief statement of the verdict of the inquest on one side. This might include verdicts such as chance medley or felo de se (accidental death in self defence or suicide), or it could include any number of more obviously descriptive causes of death such as manslaughter, drowning, fever, etc. The name of the victim will also normally appear here, and the parish in which they died. On the reverse side of this document a formal statement of the verdict is included. This is normally quite generic in form, reproducing many stock phrases, but also including the bald details of the death, and the location of the inquest. Some formal inquest documents are pre-printed forms, with details filled in by hand, while others are entirely manuscript. The inquest document will also include the names of between twelve and twenty-four jurors empanelled to examine the body and hear witnesses. In some examples the signature and seal of each juror is also included on the inquest. In its original form, this document was folded into an envelope and used to hold other related items including the warrant and depositions. On being notified of a suspicious death, the coroner issued a warrant to impanel a jury, and instructed the local constable to carry it out. Although coroners' juries were made up of substantial householders, the precise criteria upon which jurymen were selected remains uncertain. As the warrant took the form of a standardised piece of legal text, printed forms with the date, etc. 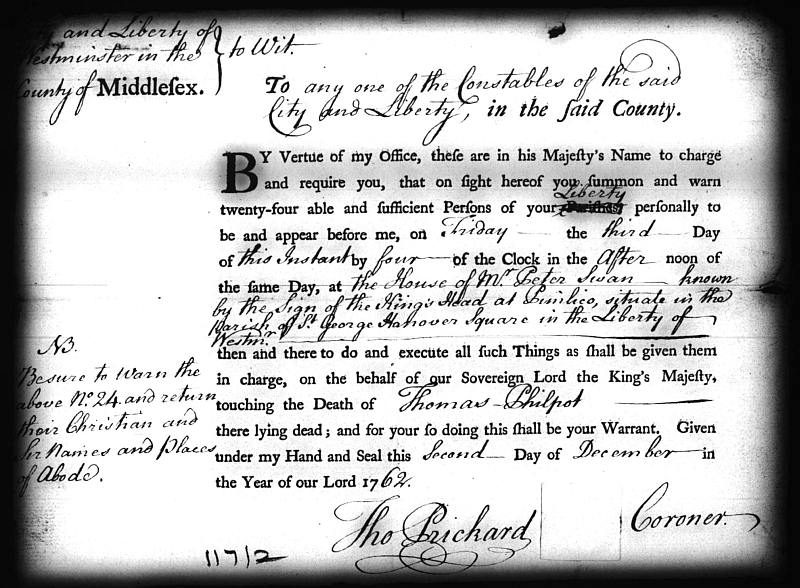 filled in by hand, emerged from the mid-eighteenth century. A jury list, including the names, and frequently the addresses, of up to twenty-four individuals, is also normally included as a schedule associated with the warrant. Although legally obliged to include residents of townships distant from the death, coroners' juries in Westminster, Middlesex, the City and Southwark appear to be made up exclusively of residents of the parish in which the death occurred. Juries for prison inquests were made up of half prisoners and half local residents. Witnesses were called to give an account of any circumstances relevant to the death being examined, and the depositions of their evidence are preserved for most of the inquests reproduced on this website. These depositions are a valuable source as they appear to have been taken down rapidly and in a form that was near to the actual words spoken by the witness. Although some legal expressions are present, these tend to bracket phrases of a more unusual and descriptive kind. They are normally signed or marked by the witness at the bottom. Fisher, Pam. The Politics of Sudden Death: The Office and Role of the Coroner in England and Wales, 1726-1888. Leicester University PhD, 2007. Forbes, Thomas. Coroner's Quest. Transactions of the American Philosophical Society, 68, part 1, 1978. Impey, John. The Office and Duty of Coroners. 1800. For further reading on this subject see the London Lives Bibliography.